A cafe greets visitors at the entrance of the Shakespeare & Co. bookstore in New York City. I have finally come across the bookstore concept for the future and it’s not coming from Amazon or Barnes & Noble with their cross-channel pipe dreams. It’s Shakespeare and Co., which opened under new ownership in November 2015 and currently operates one store in the Upper East Side of New York, with more planned for the future. There is one constant across all great retailers and that is their unique ability to instill passion among customers to spend time (and money) with them. They must offer a unique experience. Best Buy accomplished this unique differentiation back when they first brought the excitement of the bumping Consumer Electronics Show into their stores. Their stores capture the vibe of a big tech trade show, with lots of large-screen displays and exciting areas around the floor devoted to emerging product categories. Urban Outfitters is another example, in the way that they revolutionized how products are merchandised, how customers flow through the products, while creating a hip vibe. And now we have Shakespeare and Co.
Shakespeare and Co. is owned by Dane Neller, one of the founders of the Espresso Book Machine and former CEO of Dean and DeLuca, an upscale grocery chain founded in New York. What he and his team have done with their bookstore prototype shows they understand the critical importance of building community in achieving retail success -- especially in our lonely age of the internet. The café as you enter feels like a Dean and DeLuca, with lots of great drinks and food. It was packed on the day I visited and Neller told me they typically serve 400 customers a day in the café alone. The coffee is the lure that brings people in. It’s not set off to the side or in the back. It’s facing the street. Just beyond the café is the core component of this new vision for the bookstore and its unique ability for creating community: the Espresso Book Machine. 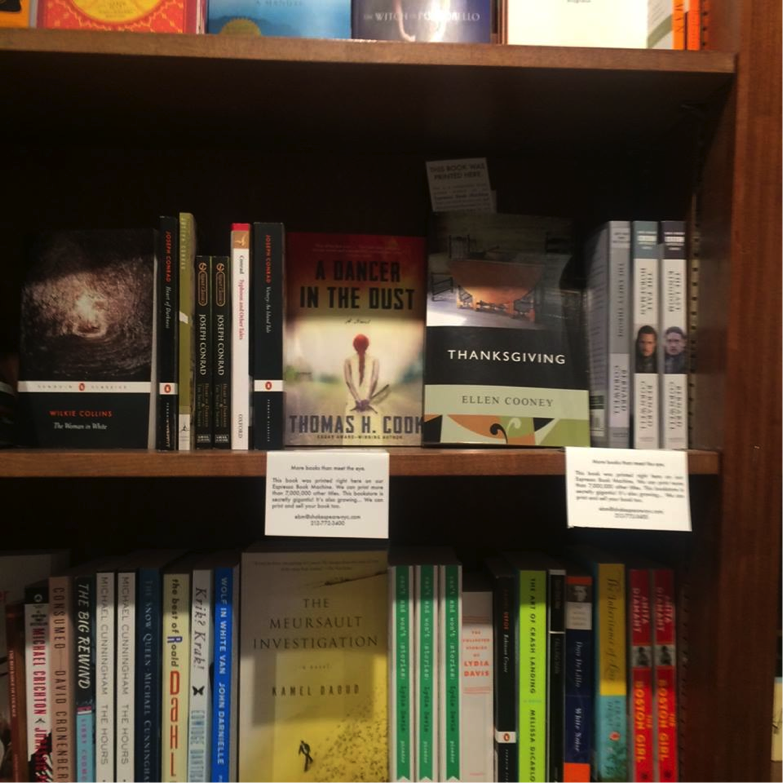 Unlike most other bookstores featuring a machine, Shakespeare and Co.’s is right in the heart of the store. It draws curiosity because EBMs are one of the few new things happening in book retailing, which on the whole feels stale to me. Customers are drawn to the machine and are able to watch books being printed on demand. EBM-printed books are also on display and interspersed among traditionally published titles on the main bookshelves. “This Book Was Printed Here” titles are interspersed with pre-printed titles. What this says to customers is, your book could be here too. So the shelves are in fact creating new business for the machine and the store. This works well for a local indie bookseller, as a self-published author living nearby could realistically buy and sell ten copies on her own. I snapped some photos of the titles my firm Publerati publishes shown on the shelves. They have sold about ten of each title this year. HarperCollins seems to be the only major publisher taking advantage of this new machine, as I saw their Espresso Machine titles on the shelves as well. The third layer of this unique concept is the excellent selection of preprinted titles. This is something all indie bookstores can and should do, but in my observations of late, many are walking away from their core purpose by adding more and more non-book merchandise. To which I say, let Barnes & Noble sell toys. You have a unique local clientele with particular book tastes. Serve them well and you will be just fine. The impact of these print-on-demand machines in the stores is far-reaching, especially for authors. Once your book is in the Espresso Network, it will not go out of print. Preprinted books are a huge gamble for all involved, where you roll the dice and overstock inventories only to make returns that force the book to be declared prematurely out of print and eventually carted off in bins for remaindering. Dumb. That’s not good for authors or anyone else in the distribution chain. This new store concept fits perfectly into the likely future landscape of bookselling. Online book ordering will also be a big deal and belongs -- you got it -- online. I can order any book anytime anywhere. It’s effective, quick, and solitary. But designing a store to encourage online purchasing strikes me as a bad idea, one that other retailers have tried (Circuit City, Best Buy). Another example of this is when American Greetings was first contemplating putting greeting card kiosks into food and drug chains. They halted their rollout once the consumer research indicated people did not want to build a greeting card while standing in a store. They could simply do it online at home, in their jammies. But when I want to grab a great cup of coffee, something fresh and healthy to eat, and hang out with other like-minded book lovers, Shakespeare & Co. is the place to go. (Slogan time?) And if I want to feel the pride that comes with authorship and see my book on actual store shelves, I can now enter that rarified world heretofore preserved mostly for well-known authors. I encourage you to visit this store to get an early look at what the future of indie bookselling may well become. It’s located on Lexington Avenue between 68th and 69th Streets.